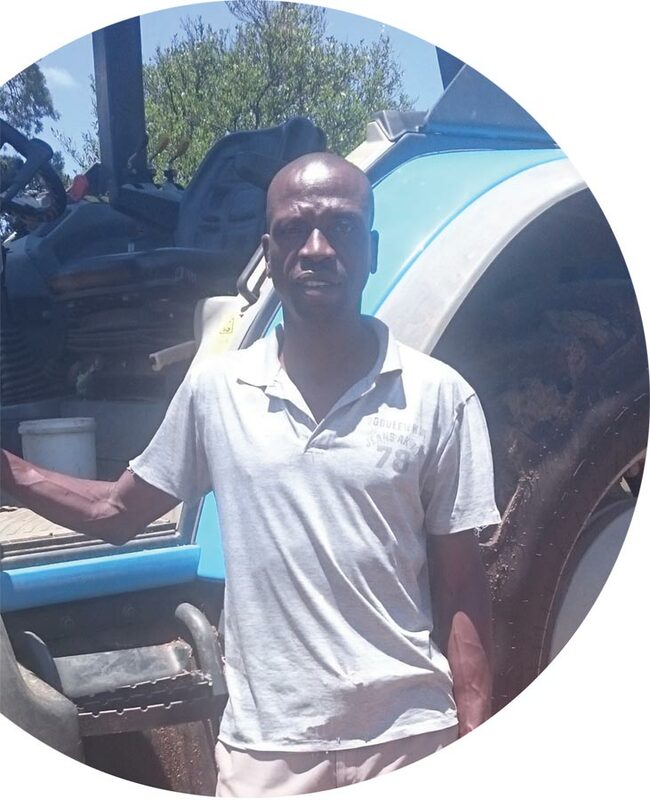 Knowledge, technology, working hard and having a passion for what he does, is what makes Remember Wiseman Mthethwa the dedicated farmer he is. Remember is part of the Advanced Farmer Programme, a 250 Ton Club member and is currently the chairman of the Amajuba Study Group in Newcastle. I farm in the Dannhauser area, between Dundee and Newcastle in northern KwaZulu- Natal. I lease the farm Milnedale, from Mr Albert Eicker from Pretoria, which is 612 ha in extent. This was a family farm but was not occupied by the family for many years, and was leased out to various farmers since the late 1940s. I have managed to extend and open lands to 200 ha. When I originally started there were about 40 ha lands available, with some very old fallow lands. Last year I purchased a 14 ha neighbouring smallholding, Greenvale, which had rudimentary pig facilities and some lands too. I am leasing 80 ha lands from Mr Henk Zaal, on the farm Lilydale, and a further 20 ha from Mr Willem Raubenhorst. I have planted 260 ha maize and 53 ha sugar beans this year, having lost some of my previous years hired lands. I run a 140 beef unit, of which I have 80 cows with calves. I also have a 12 sow breeding unit, 70 sheep and 52 goats. The pigs are a fairly intensive business, and I use some of my maize to mix their feeds to keep the costs down. Currently I will have enough maize to get through to harvest time – this makes a very big difference in the face of rising feed costs. We grew up on the farm Lilydale and worked and lived for Mr Louis Alberts, but we also farmed for ourselves. Mr Alberts was my rolemodel – he worked hard, he worked us hard and he managed the whole range of enterprises on the farm. I learnt to see that farming is my life – it gives my family food, an income and also a future. It is important for our nation too, as all people need food to live. Strengths: My strengths are the skills I have learnt – cropping, livestock and knowing what was needed on the farm. I work hard and have a passion for what I do. I also enjoy working with people, helping those I can and learning from those that have something to offer. I am willing to try new things and am open to try everything, I don’t feel limited. Weakness: My weakness is that I was not highly educated, and often need help with these skills. At times this limitation can be very frustrating, but I am striving to improve. When I started in 2012, my yields were poor – white maize was 2 t/ha and yellow maize was 3 t/ha. At that time it was better than we did at home but I could see that the commercial farmers were doing MUCH better and I wanted to improve too. My first crop was on 40 ha. Last year was also a drought year for us, but I managed close to a 4 ton average. This year the crop is looking much better despite the drought – I believe I have the potential in me and on these lands to produce 6 t/ha. Some of the lands could produce 7 t/ha, none should yield less than 5 t/ha. It is still in the hands of the Maker to determine what the yield this year will be. Knowledge and technology. I started to do soil sampling, and apply better agricultural techniques, using better seed, chemicals and fertilisation. For cropping I believe my future lies in the soil, and thus need to improve it. Where I can, I use chicken litter to help improve (humus levels) the soil. I have learnt from my mistakes and am always willing to try new methods. This year I have started to try some ‘no-till’ to see how that goes. When I first started out, Seda assisted me with business training and management skills. The Department of Agriculture has helped with training courses, especially for the livestock side. The SA Breweries project this year has given us some training and I have also attended training courses through Grain SA. My mentor has also assisted with in-field training and explanations. I would like to develop my skills in the engineering and maintenance side, welding etc. I have not done a specific maize course and would like to do one, taking it further to a more advanced course as this is my main crop and agribusiness. I would also like to learn more about precision farming and using the technology available with it, especially GPS monitoring and applications. It is nice to have those thoughts, but to get there is something else. One must be realistic, acknowledge it will take very hard work, capital (feels like it’s just a dream) and an unpredictable climate and conditions. I would like to be utilising the best technology available, applying precision farming and doing this all myself. I would like to have my own place. Renting is risky as I put in much effort, and each time I improve, the rental just goes up. My advice is to have a PASSION for farming, work hard, be dedicated and use the opportunities. Don’t wait for someone else to do everything for you, start with what you have and don’t be in a hurry. Learn what you can, from mistakes you make and from others. You won’t always make much of a return but you need to persevere – farming is not a high return business. Knowledge is complicated, you can learn about it but you need to practise it and get those who have done it to help teach you. This drought has taught me that water is precious, for people, livestock and for cropping. Everything must be done to improve, store, and utilise this resource carefully. In my spare time I am constantly thinking how to improve myself and my industry. Our nation needs food. Those thinking of entering farming need to consider carefully what they REALLY want, too many people want to farm, and getting farms are actually NOT farmers. As a farmer you need to be able to rely on yourself, to be able to do it yourself. Don’t think you can rely on others or contractors to do it for you with all your best interests at heart. You need to be able to DO IT YOURSELF.